Anxious to get into and see what the Karigini National Park has to offer, we secured our accommodation by telephone at either end of the Park before leaving Exmouth. Good job too, as Tom Price township (the nearest settlement to the Park) had no beds on offer .. apparently a touring bus load or two had already snapped-up all of the available accommodation. 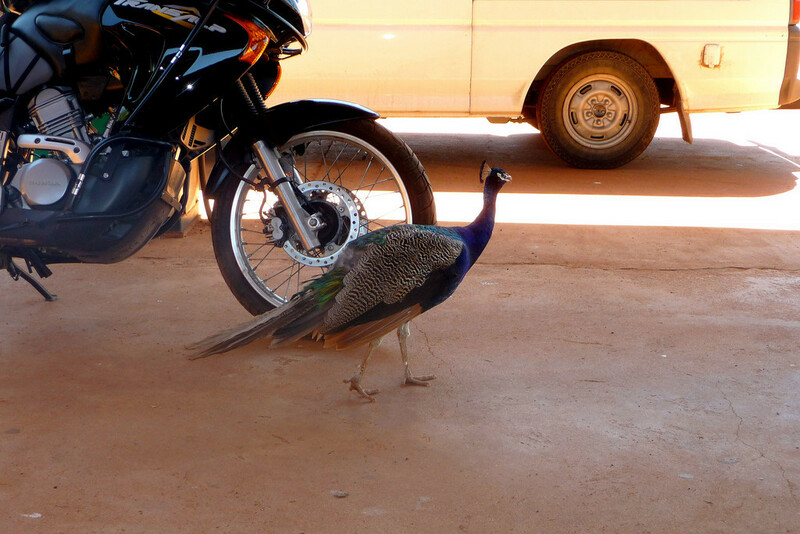 No matter, as we managed to successfully book lodgings at both the Paraburdoo Inn and the Munjina (Auski) Roadhouses. 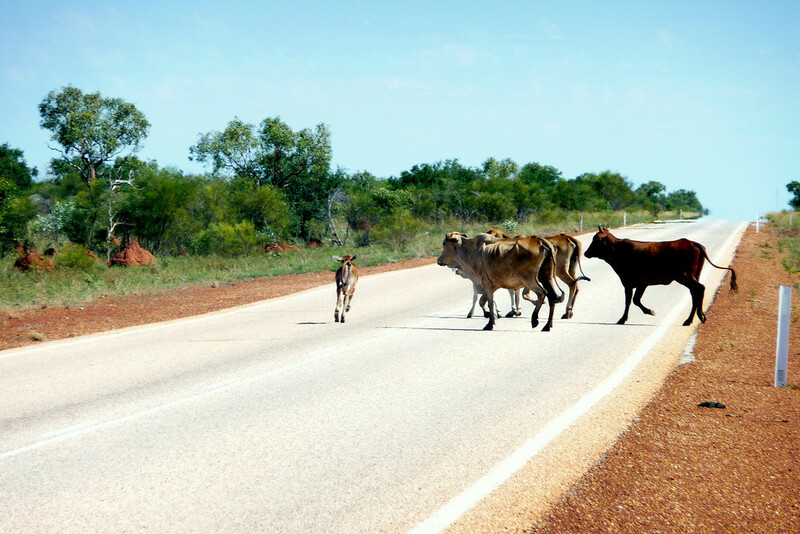 Paraburdoo is about 70 km [44 mi] southwest from the Park's western entrance; whilst Munjina /Auski is located at its northeast corner. There's a distance of 213 km [133 mi] – a three-hour journey – between the two locations, which will give us plenty of time to explore some of the Park along the way. 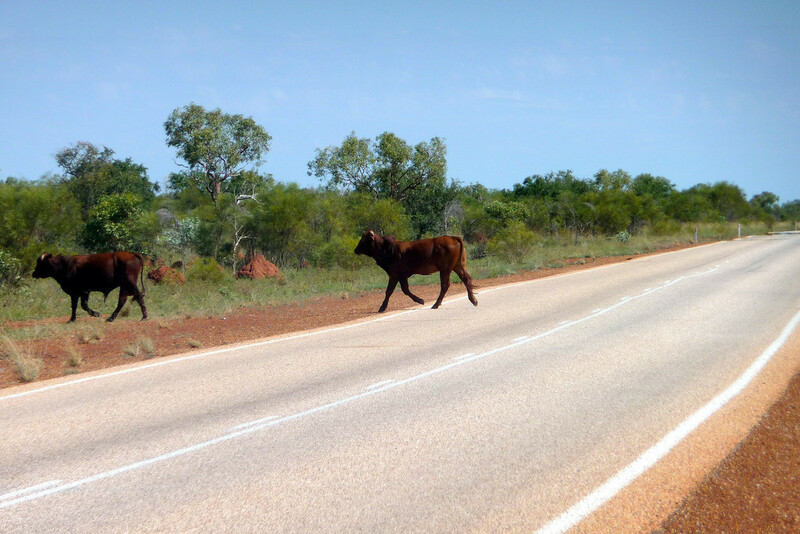 We set-off from Exmouth around 07:30am as we have a comparatively long ride of 555 km [347 mi] ahead of us before we reach Paraburdoo. 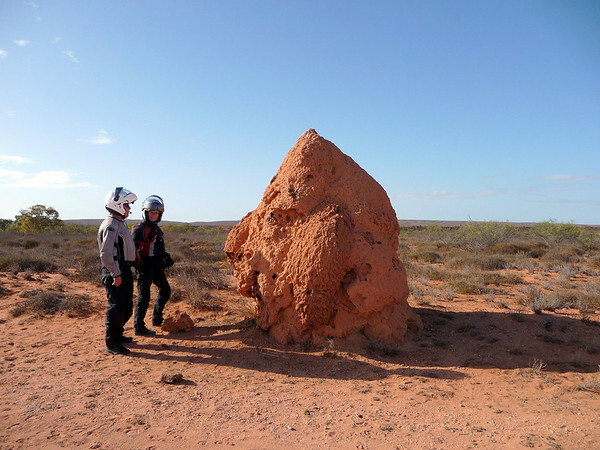 After about 50 km [31 mi] we stop to take a closer look at this huge termite nest. With the benefit of 'fuel insurance' from a newly purchased 5-litre plastic jerrycan, I take advantage of the day's run, to see just how much mileage I can squeeze-out from a full tank of petrol. 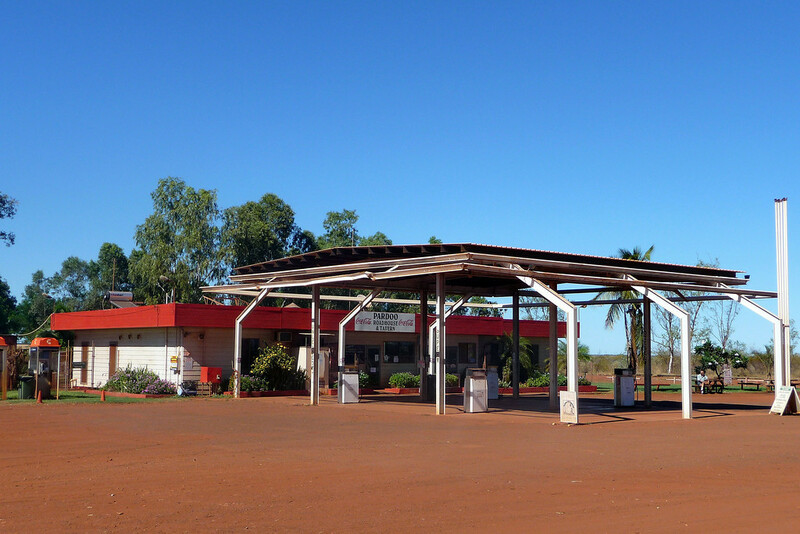 The first re-fuelling opportunity is 280 km [175 mi] away from Exmouth at the Nanutarra Roadhouse. There's virtually no wind, so it's a good day to experiment in this way. The Alp is allegedly capable of covering 300 km [188 mi] on a full tank, so let's put that statistic to the test! 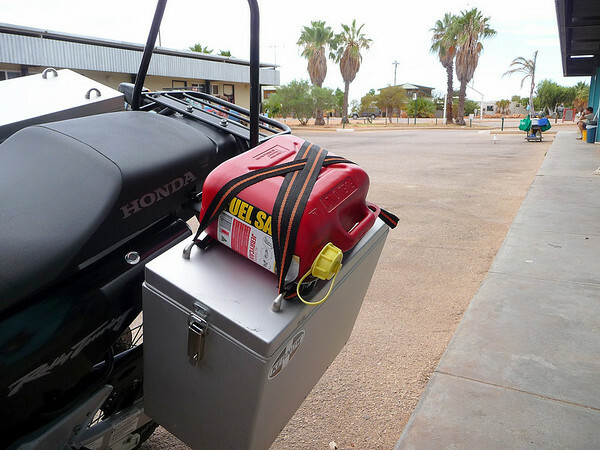 [LATER] Well, at 250 km the fuel gauge is indicating 'empty' – but we press-on in any case .. and make it all the way to Nanutarra .. no problem. At the pump I just manage to dispense 17 litres into the Alp's tank. This means that we're achieving just under 16.5 km per litre of fuel. Now, the Alp has a 19 litre tank, meaning that, in theory, we could have ridden another 33 km before running out of gas. Verdict: A fully-laden Honda Transalp carrying rider and pillion; travelling over reasonably flat terrain – with little or negligible headwinds – can cover a distance of around 310 km [194 mi] on a full tank of petrol, which can't be all bad for a little 650cc dual-sport bike, eh? 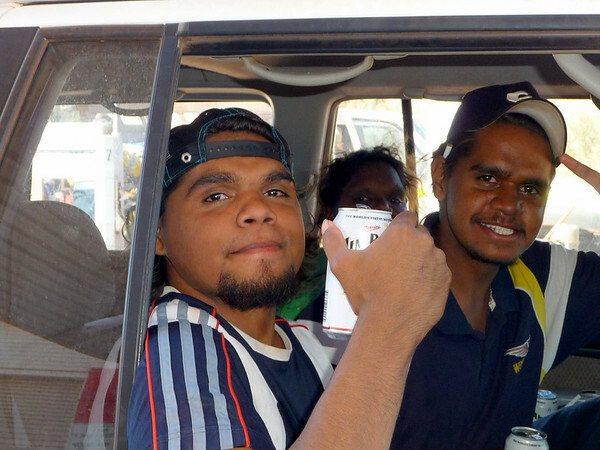 With a couple more refreshment stops along the way, we arrive at the Paraburdoo Inn at 3:45pm. 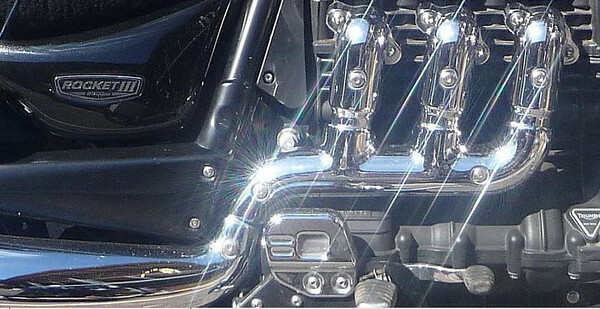 It's been an informative 556 km [348 mi] ride today .. and I'll bet that we didn't see more than 20 other vehicles – going in either direction – throughout the whole seven hour ride. We're noticing that nightfall is occurring much earlier nowadays. Dusk happens quickly too; there's no real twilight period to talk of either. 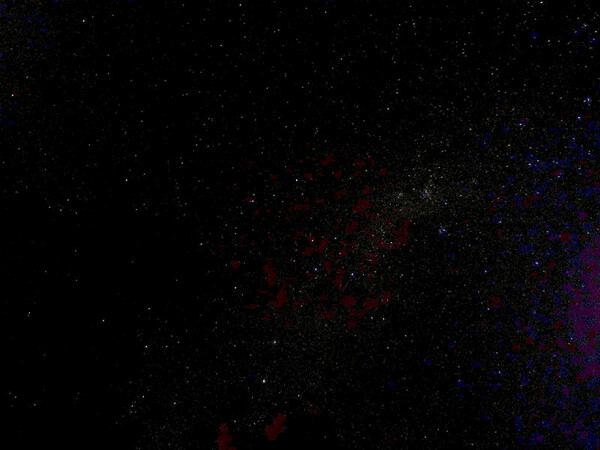 By 6:30pm you can start counting the southern hemisphere stars in complete darkness. Whereas back home, in England, the days will certainly be drawing out at a rapid rate at this time of year (Springtime). 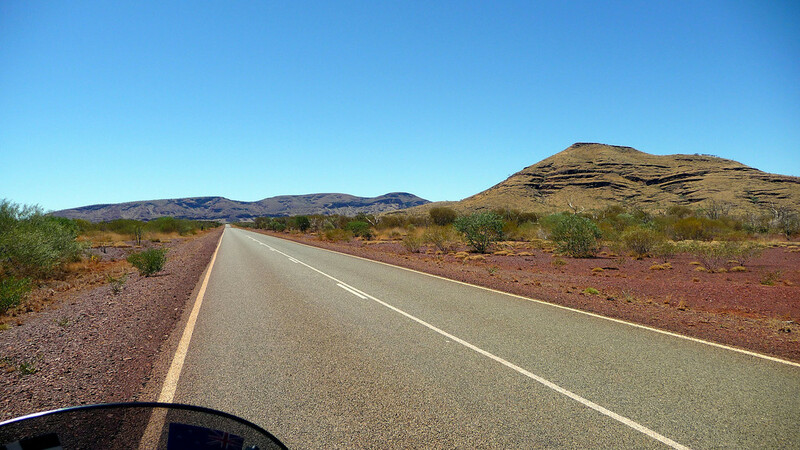 Anyway, this aussie autumnal morning, we're on the road from Paraburdoo by 09:00am; and the ambient temperature is already approaching 30ºC! 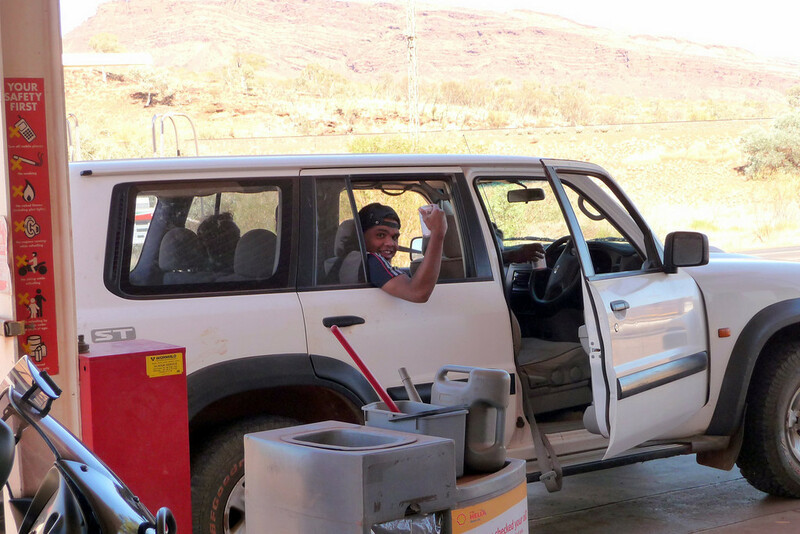 80 km [50 mi] – just under an hour's northbound run – later we pull into the oasis township of Tom Price. Odd name for a settlement isn't it?! .. I wonder who they named it after? 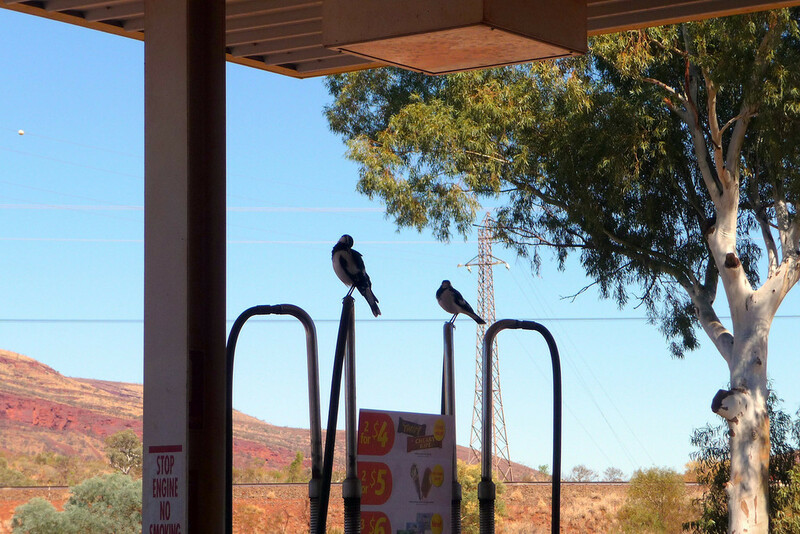 At the local Shell Filling Station, I notice two birds preening themselves on top of the dispensing pumps. Thinking this an odd sight .. and that they were unusually fearless little fellows, I decide to take a picture to pass the time of day. 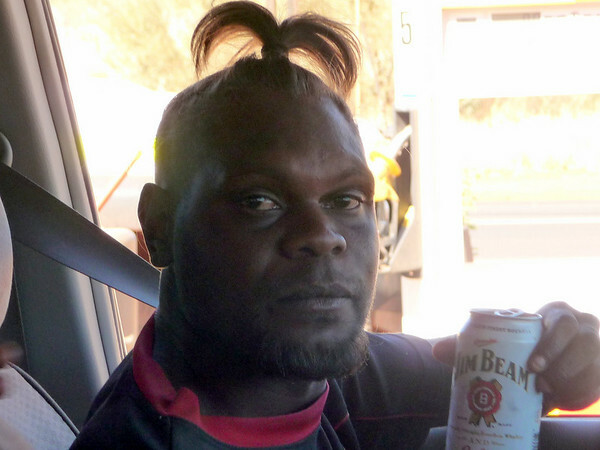 We have been here in Oz for a month now, and this is the first occasion we've had to talk to real indigenous native aussies. The time is barely past 10:00am .. and they're on-the-piss already! The beautiful young. They're all just the same .. all talk the same too .. the whole world over. Oh-so precious youth is definitely wasted on them [.. now I'm starting to sound like a grumpy ol' git, eh?]. Scrambled eggs & bacon, toast & butter .. and a double-shot 'flat-white' cuppa coffee later .. and I notice that even the birds up in the trees are at it! 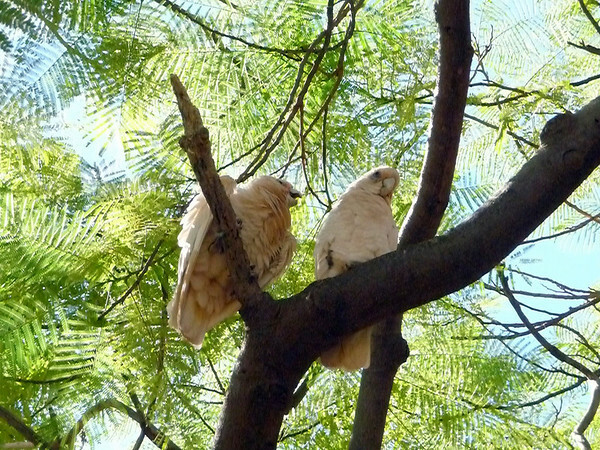 The puffed-up parrot fellow on the left is busy squawking amorously [non-stop] at the .. umm .. 'bird' on the right. She's obviously playing hard-to-get, as you can see. Maybe he should try puffing-up a few of his head feathers into a crest-like shape a bit more?! 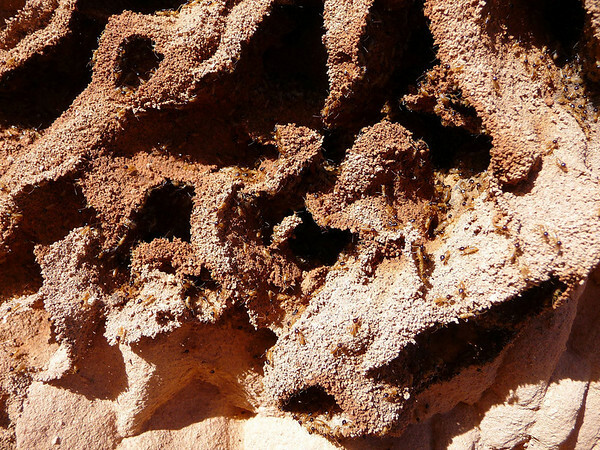 Nothing much is too different in this particular sector of the natural world either! 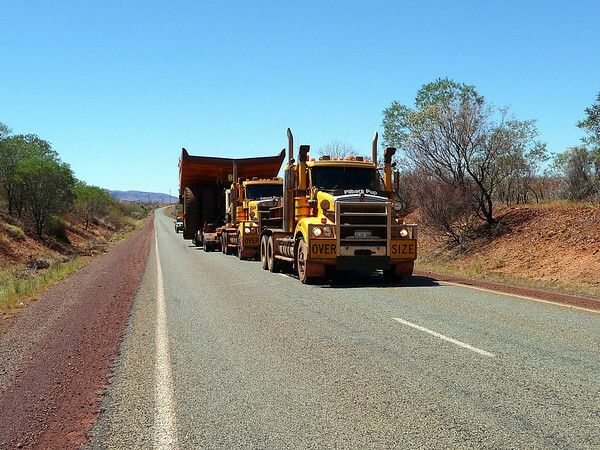 We move-on eastwards, under a completely cloudless sky, into the western entrance of the Karijini National Park .. for an afternoon walkabout ..
.. and almost get run-off the road by a massively oversized truck load. Good job we pulled over and stopped well ahead of our encounter. It would NOT have been a 'Clash of the Titans' had we met head-on .. and at some speed. 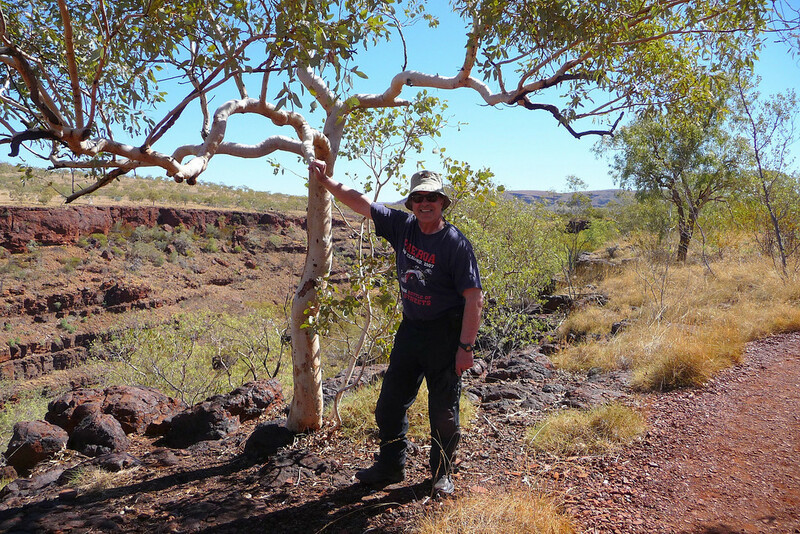 In the Karijini NP .. at the Visitors Centre, I buy some new head-wear. I recently read somewhere that a broad rimmed hat, in theory, is supposed to confuse those pesky flies. This flower-pot-man hat is the best I can find that will wrap-up and stow-away nicely into my tank bag .. The theory doesn't work BTW! We spend a reasonable amount of time in and around the Park's 'Dales Gorge' and .. The Falls are reached by descending a steep trail from the car park at the rim of the Gorge. Zooming down we notice that there's a bunch of kids down there having a great time in the water. Best leave them to it. Besides, we just didn't fancy the walk back up; not in this region's mid-afternoon heat [of getting close to 40ºC – with 80+% humidity]. Leaving our belongings on full display on and around the bike for an extended time isn't really a sensible option either, unfortunately. There's simply isn't the room to lock it all away, securely and out-of-sight – and we definitely need all our kit to complete this trip. 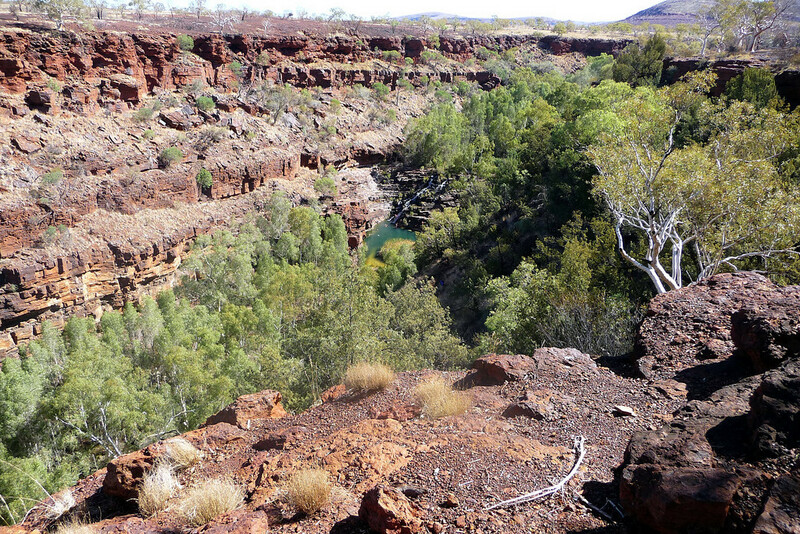 We check-in at our new lodgings, on the eastern edge of Karijini. A 'budget' room at the Auski Tourist Village, Munjina. Oh .. I DO like my new hat! It's a very HOT again. 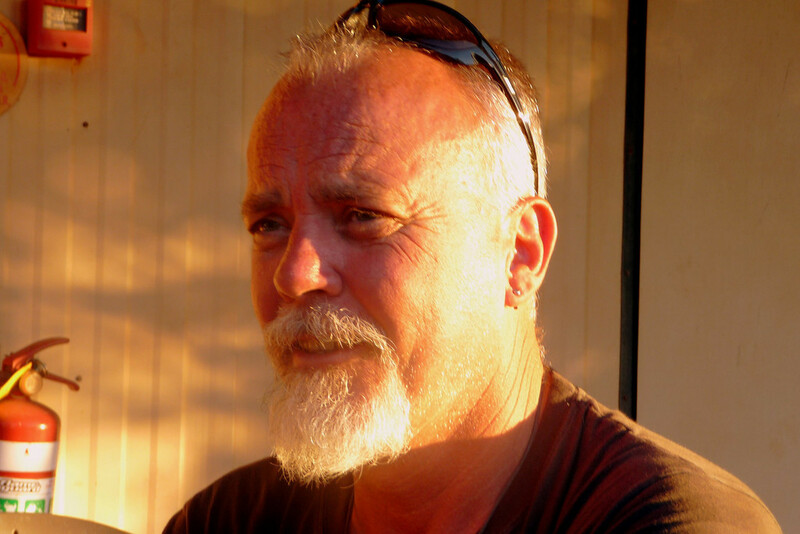 The humidity up in these aussie latitudes is quite stifling. 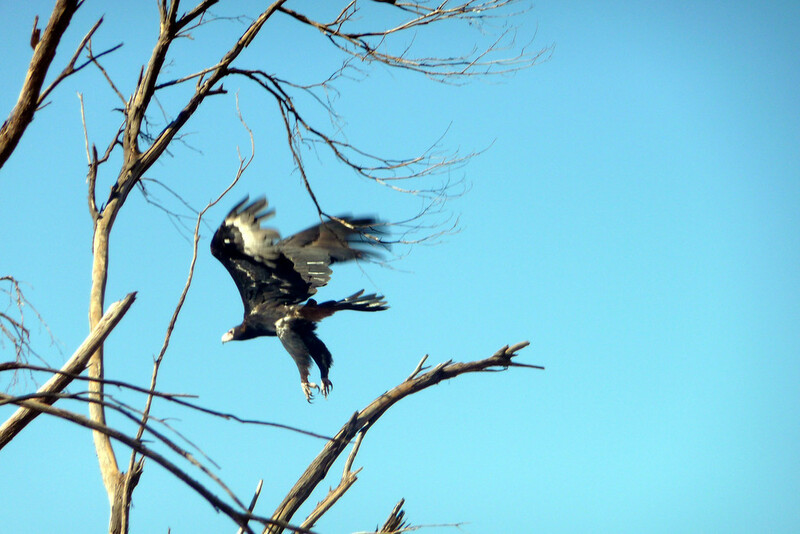 Very soon after leaving the Roadhouse, we again notice a handful of birds of prey (called 'Wedged-tailed Eagles' .. 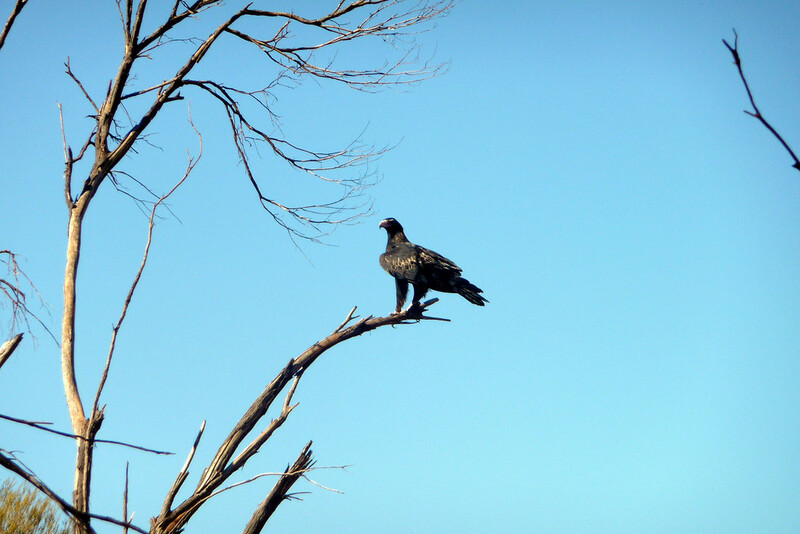 I think) up in the surrounding tree branches ..
.. and we stop at to take a closer look ..
.. and get even closer. 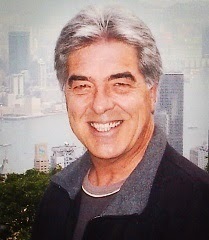 Mr Eddy spots my approach .. I must've got within around 25 metres before he decided to scarper up into the skies. A sensational sight. 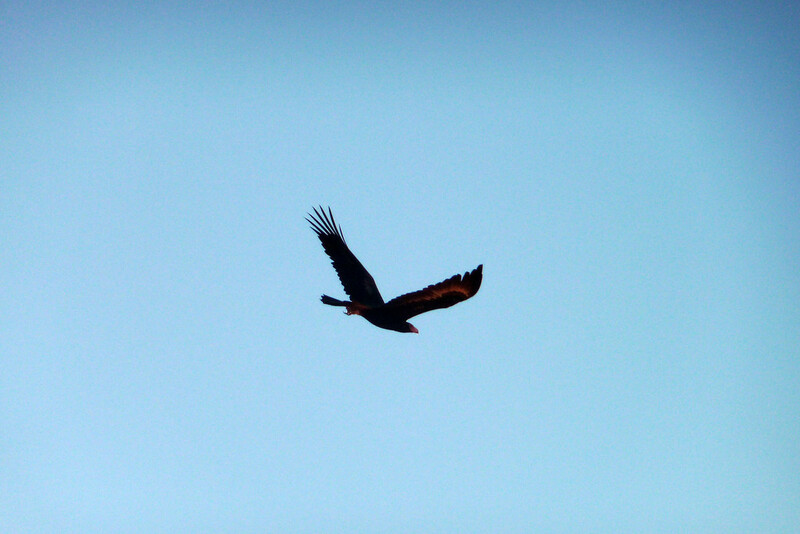 Soaring high above us, showing-off a wingspan of what must be around two metres. 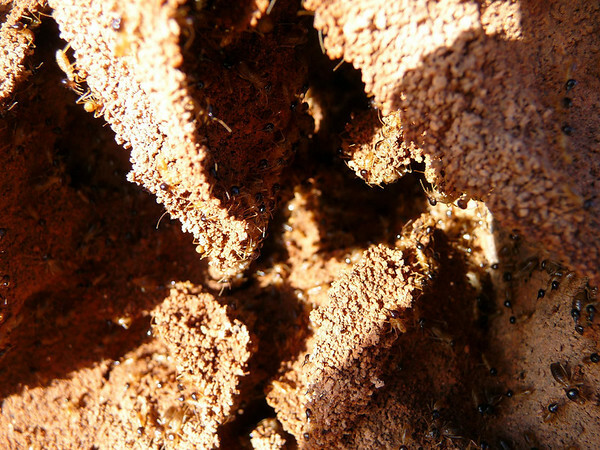 Like I said before .. it's noticing stuff like this that makes Australia such a fascinating place to visit. Ya just don't get to see wildlife like this in and around the Goss Moor, or down-round United Downs! 11:00am. We've been on the road for two hours .. and covered around 166 km [100 mi] since leaving Auski. There's another 100 km [62 mi] ahead of us before we reach any form of human settlement, which is an impossible position to be in anywhere around the British Isles. 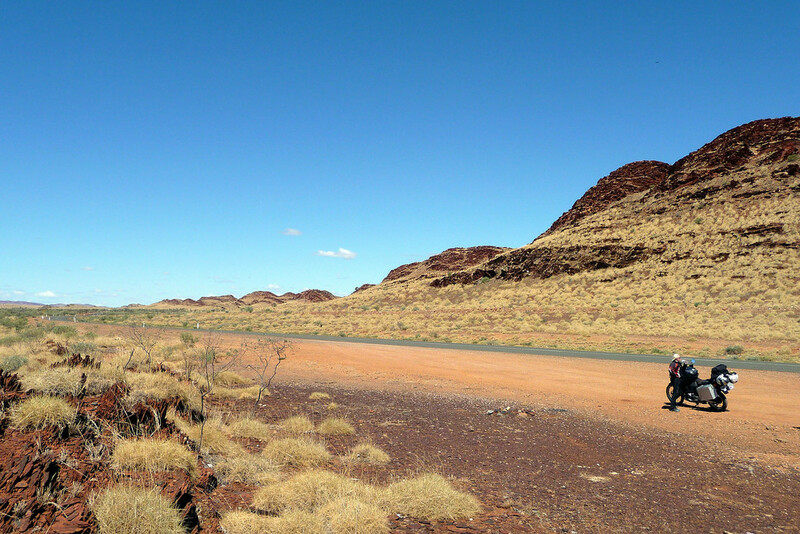 It's at least 35ºC and probably approaching 40ºC .. we're in the middle of no-where, in wonderful isolation.. I love the feeling. The heat? Well, for a pair of poms like us it's difficult to prepare for the ferocity of heat like this. All we can do .. is drink some water, then take a deep breath .. grin and bear it all .. and move forward. WHHOOOSH! 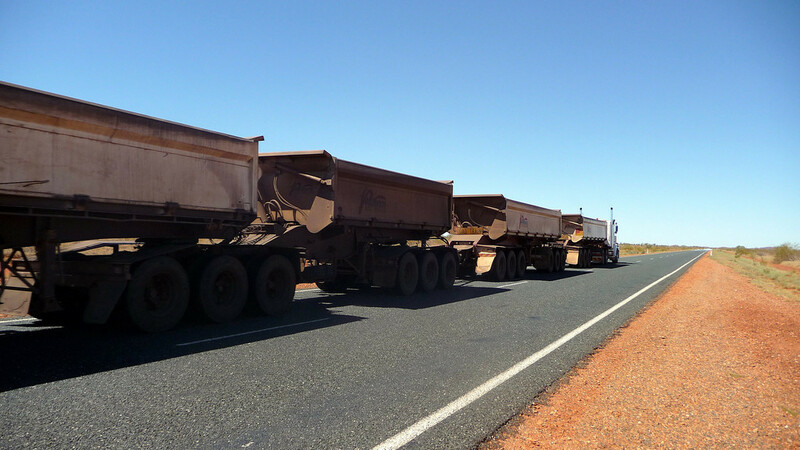 .. the only company we have out here is seeing the odd road train pushing its bow wave of hot air across the asphalt. We sway in response. Lunchtime .. and we've covered 265 km already [165 miles – about a 3-hour ride]. 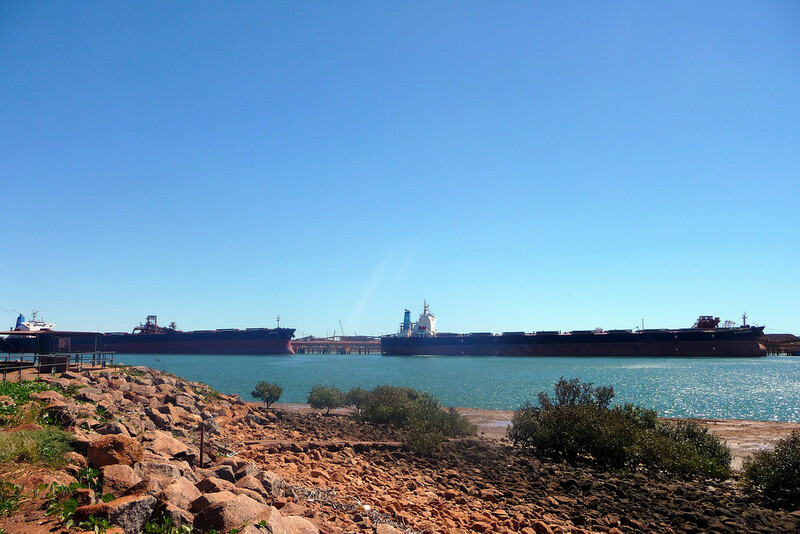 We're making particularly good progress today, so we decide to pop into Port Hedland for a sandwich and quick lookaround. 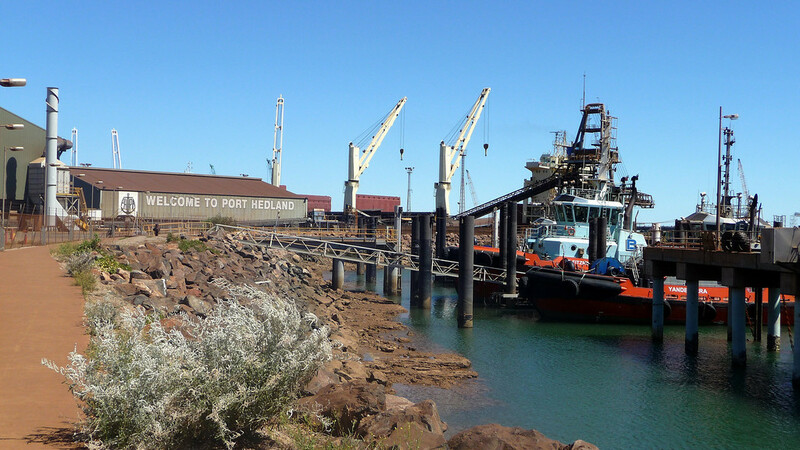 Port Hedland, as the name suggests, is a port named after the mariner, Peter Hedland, master of the 16ton cutter 'Mystery' who landed at 'Mangrove Harbour', and which subsequently adopted his name. 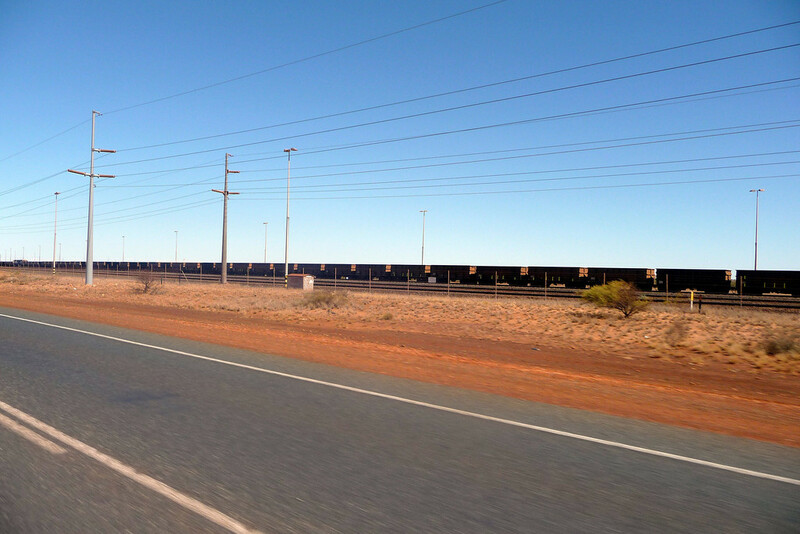 Major expansion took place here in the mid-1960s with the development of mining the inland iron ore deposits – where we've just travelled from – and today ..
.. some of the longest trains in the world, which relay iron ore from Mount Whaleback, at Newman, and can be up to 682 cars* in length. 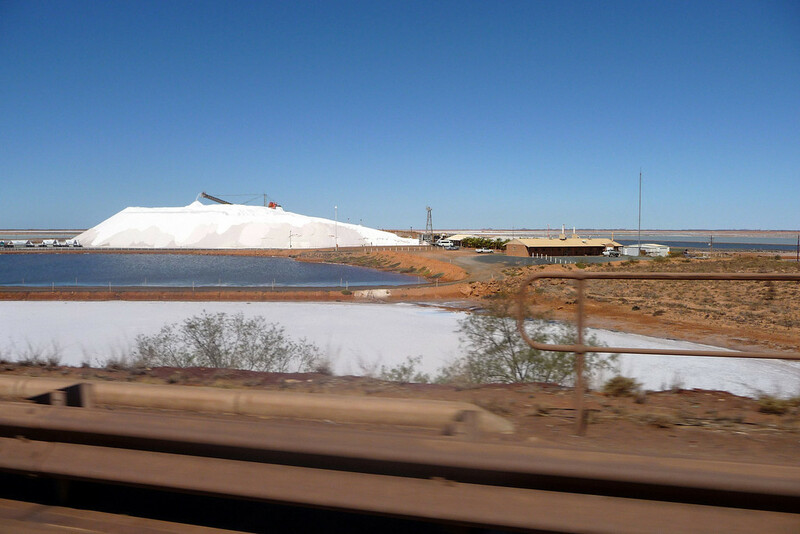 *Factoid: in June 2001 the mining company, BHP Billiton, set a new world railing record for the longest (7.4 km or 4.6 mi) and heaviest (99.7 tonnes), carrying a world record net mass (82.3 tonnes) or iron ore. The train comprised of 8 locomotives and 682 ore cars. 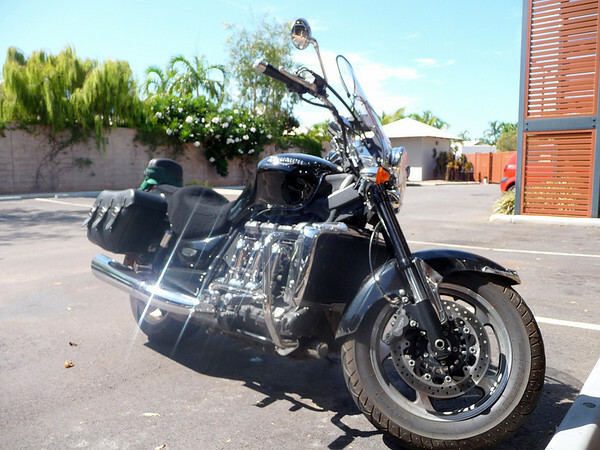 2:00pm and it's time for us to 'make like the shepherd' .. and get the flock outta Port Hedland – as we have another 150 km [94 mi] to ride, up the coast, along the Great Northern Hwy, before we reach the night's stopover destination .. the Pardoo Roadhouse. 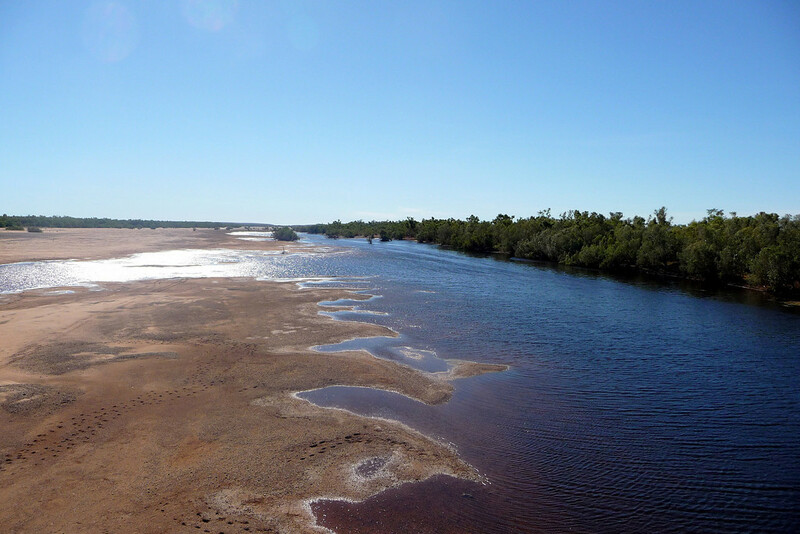 Along the highway we pass over a river – the Degrey – that's not completely dried-out. Must be worth a pic for its near uniqueness! 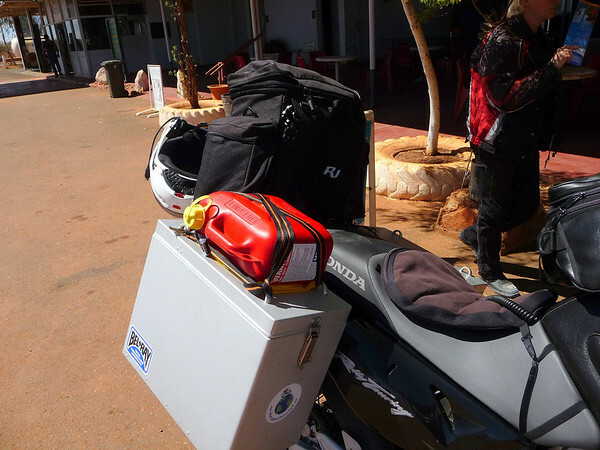 Around 4:00pm we pull in at the Pardoo; check-in and kick-out our side-stand at the rear of our lodge unit. Within a couple of minutes, the Triumph Rocket pulls-up alongside. Owned by Brett, who's out on an extended ride-around the LH side of Oz from his hometown of Darwin ~~> down to Adelaide ~~> across the Nullabor ~~> to Albany for the Ulysses Meet ~~> then up to Perth to hook-up with his sweetheart, Tracey ..
.. so we all get together ..
.. as bikers do ..
That evening Brett & Tracey re-introduce me to the delights of bourbon on ice. A wonderful beverage, which I hadn't sampled since being in Arizona almost exactly two years ago [in April 2008]. Tracey sorted out my MP3 music collection for me. So we now have thousands of songs to listen to through the Garmin Zumo GPS unit. And WHAT a good night we had under the southern night sky. 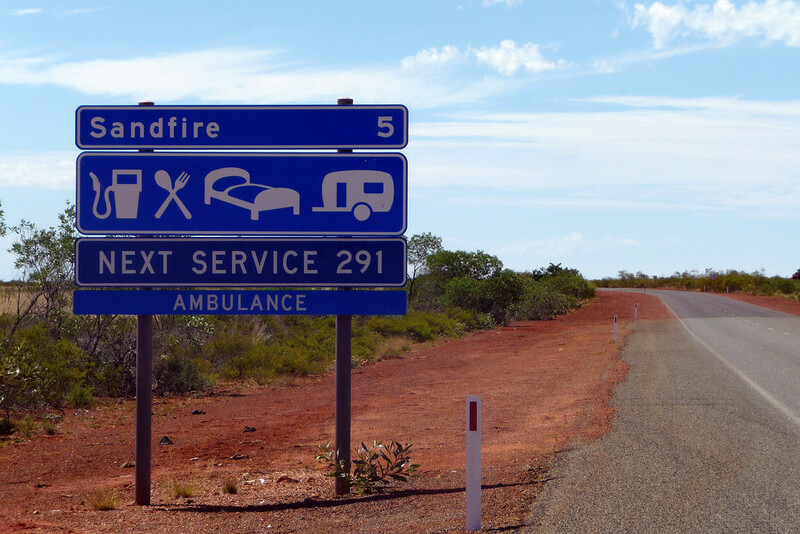 It was a comparatively straightforward and uneventful 138 km [86 mil] – about 1½ hour ride – from the Pardoo to the Sandfire Roadhouse. Despite the short['ish] distance between the two service stations we pull-in and top-up the Alp's tank in any case. The next re-fuelling opportunity after Sandfire is 291 km [182 mi] up the road .. and although in theory [+ recent practice] I should be able to make this distance on a full tank, I also fill-up the spare 5-litre jerrycan .. just to be sure. Huh? .. WTF? .. 'tis funny what you can walk across your front wheel in Oz .. BUT I mean .. a bloody peacock, of all creatures?! 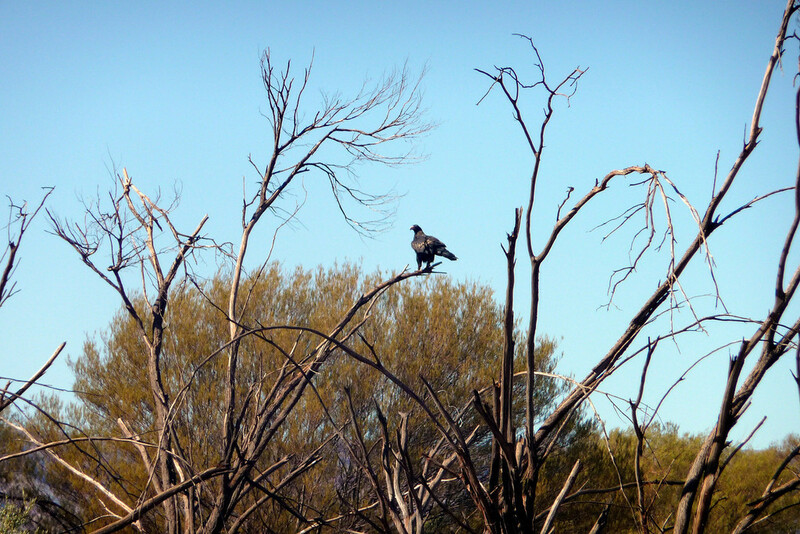 The 291 km journey up to the Roebuck Plain Roadhouse was one of the most tedious of the whole trip, thus far. Not a huge distance, of course, but the ambient conditions (heat and humidity), this far north, are really starting to get to us. 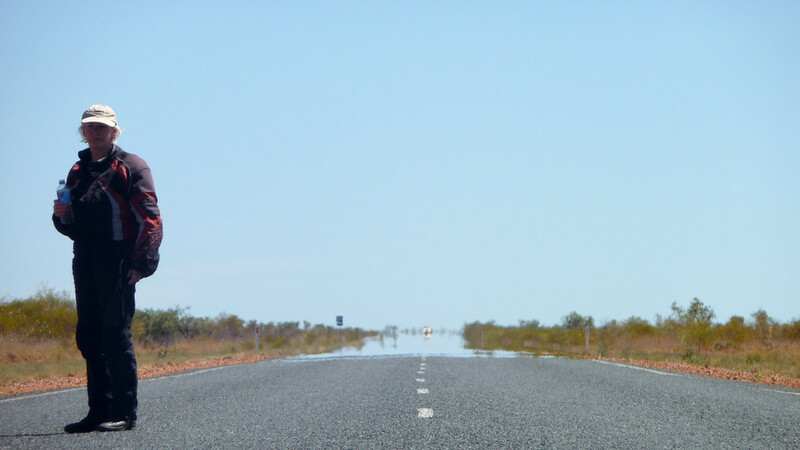 We're now stopping every 100 km [63 mi] just to take-on more water. Not to do so invites drowsiness very quickly .. as we are noticing that we're losing body fluid, at a very rapid rate, up at these tropical latitudes. 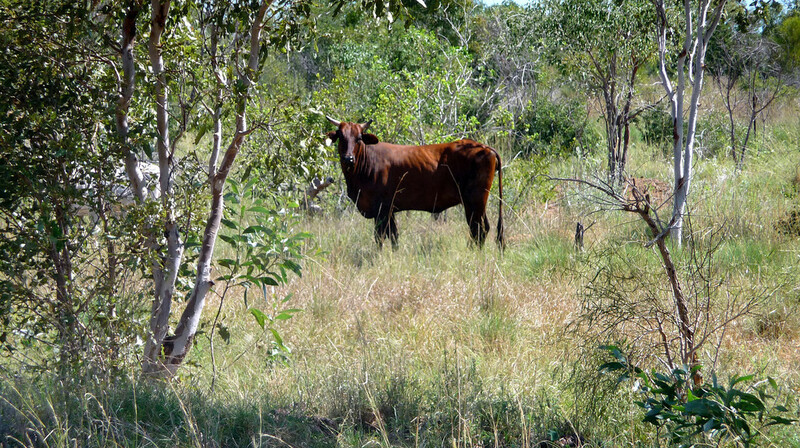 The loose cattle hereabouts seem to cope with it all though. 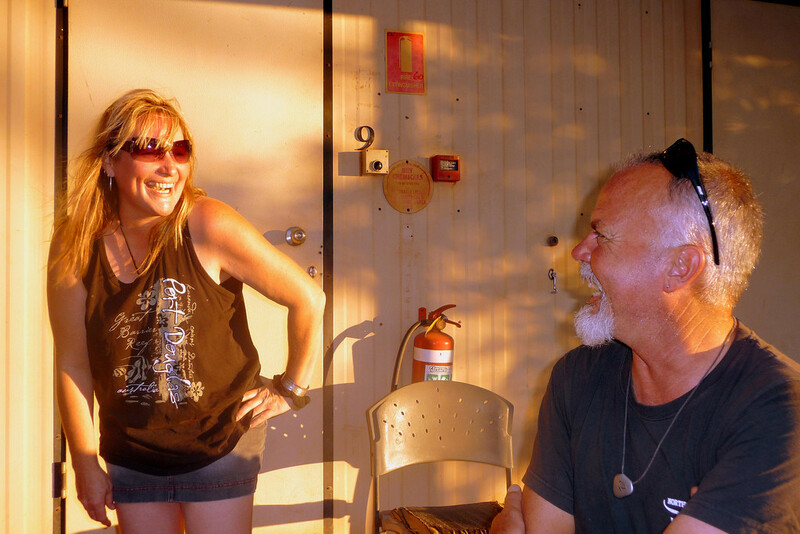 By 4:15pm we're in the Visitors Centre at Broome township, where we, and Brett & Tracey, organise our weekend accommodation. 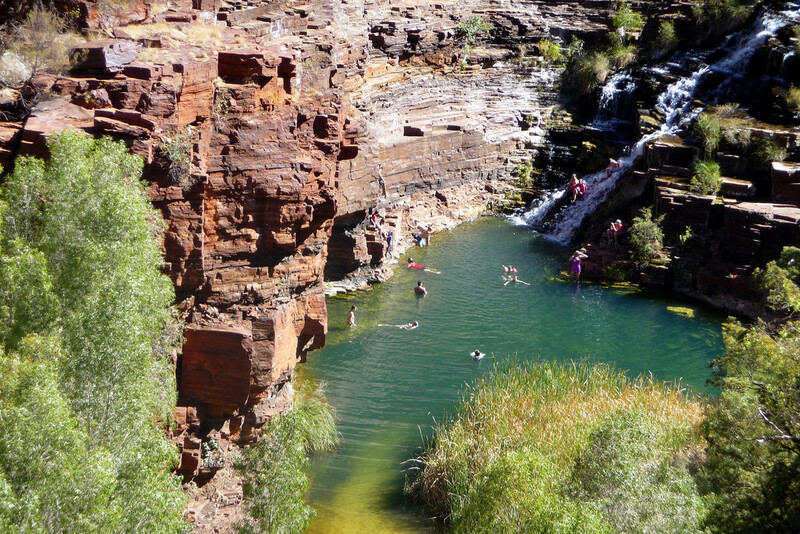 They're stopping over in Broome for two nights; whilst we intend hanging-out here for three nights. 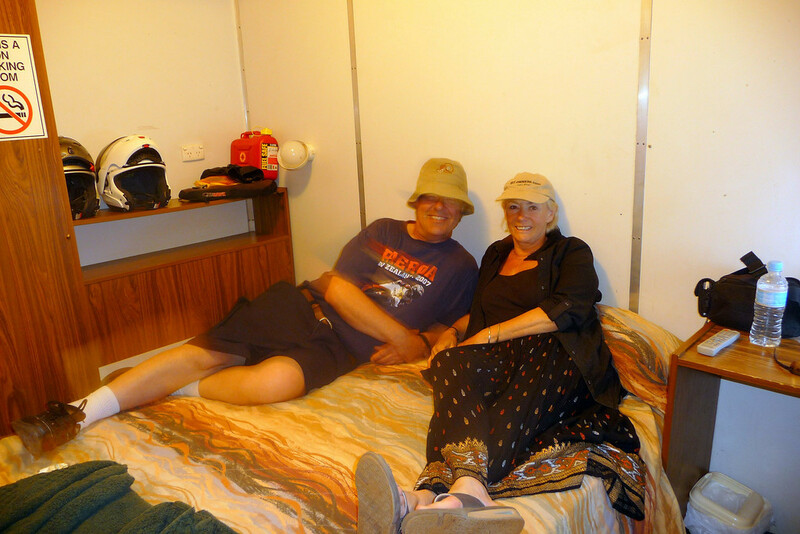 We all decide on the same standard of lodgings at the 'Beaches of Broome' holiday resort. Good choice too, as it turns out. Our en-suite rooms are right next door to each other. We are now more-or-less halfway around our first aussie tour. 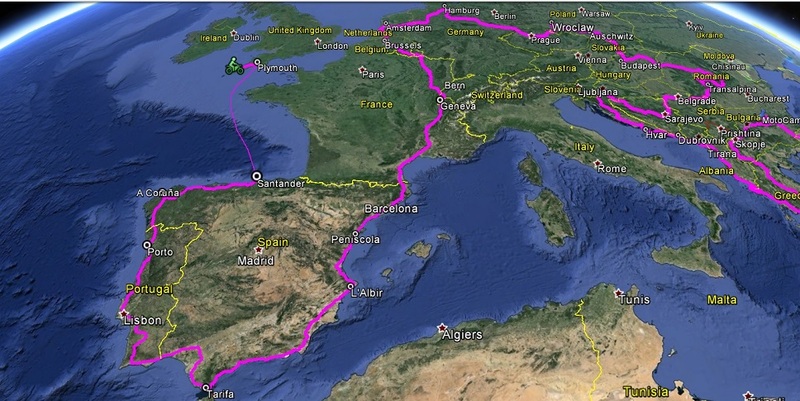 We set-off from Melbourne on the 12th March; and we should be leaving these shore, from Melbourne, on the 11th May. I reckon it's fair to say that our schedule is 'on target'. 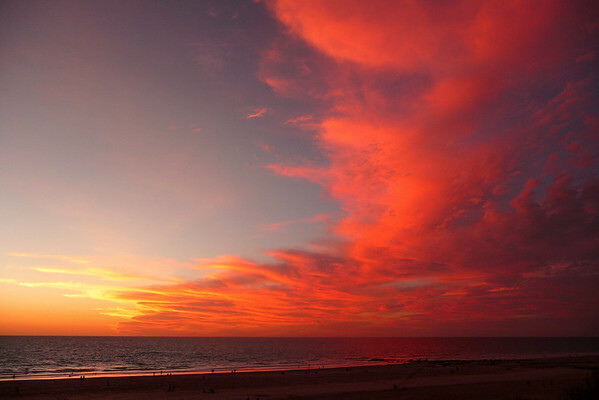 Broome is situated 18 degrees south of the equator. An ideal climate from April to September makes this town an attractive holiday destination for holiday makers in search of some beach life. So obviously we're here at the very start of the busy season. Sunday morning, 10:00am: Cable Beach, which just a 7-minute walk away from our room .. and the ambient temperature has already reached 35ºC. 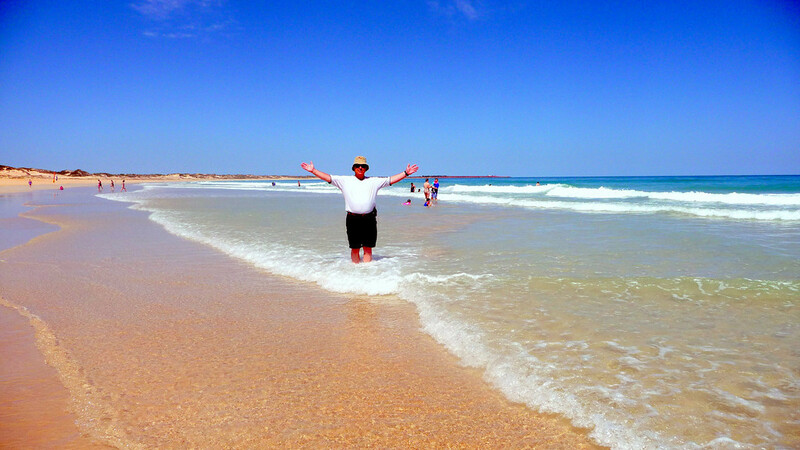 The sea temperature is an extremely comfortable 32ºC ..
.. which is warm enough to entice even me in for a paddle. 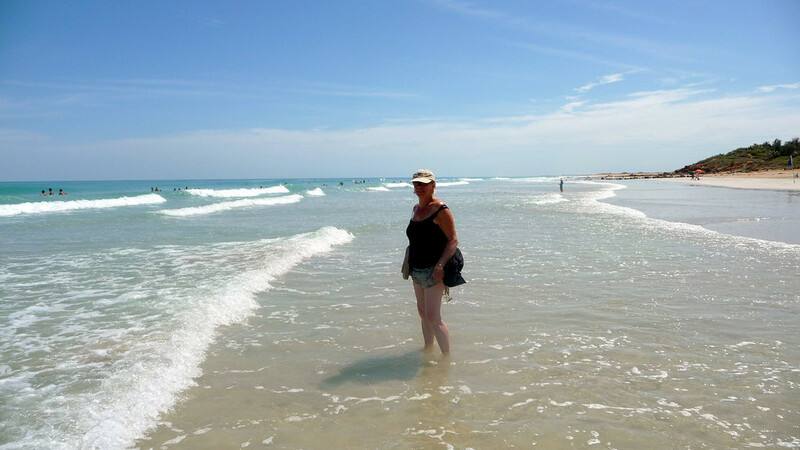 The walk back, in bare feet, across the very hot powdery sand was actually quite painful. So remember to bring your 'thongs' if you come here [ .. that's aussie speak for 'flip-flops']. 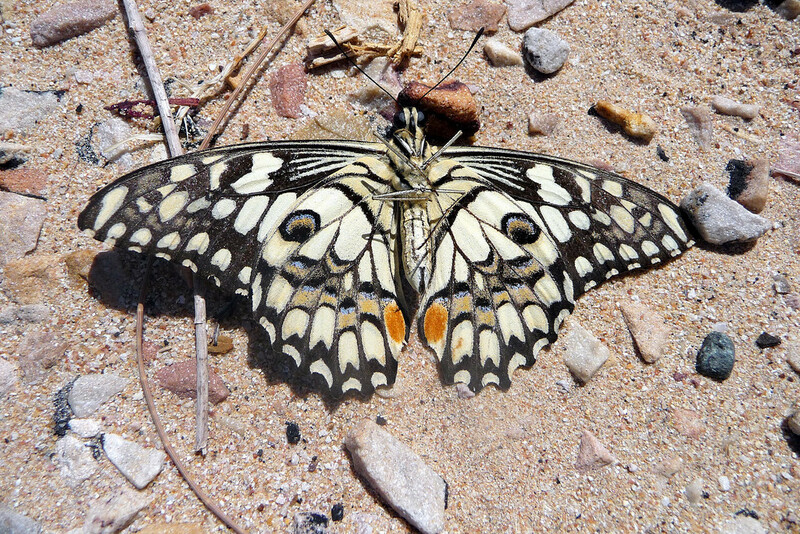 Dunno what type of flutter-by this is? .. he's either taking a siesta .. or is very, very actually dead! 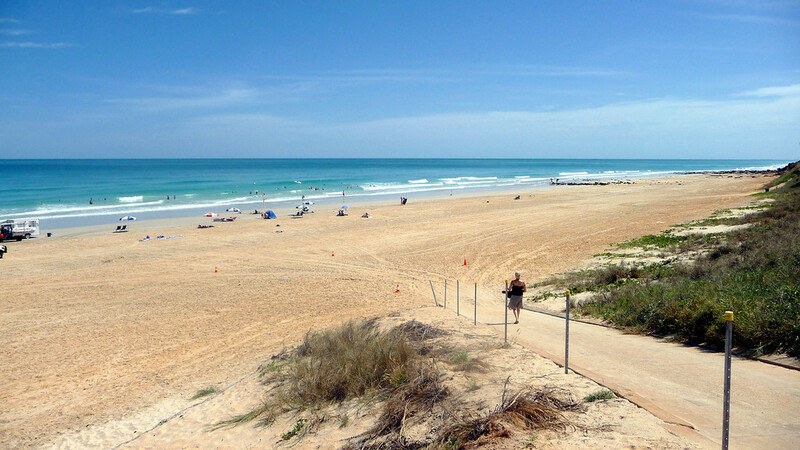 Cable Beach is named after the communications cable which linked Broome with Indonesia. It stretches for 22 km and is one of the top five beaches in the world. Famous for its sunsets .. and therefore armed with a couple of beers, a bottle of red wind, some bourbon WITH ice (yes, really! .. :o), the four of us .. that is, Tracey, Brett, Ellen and I then ..
.. wander across to the sea shore where together, we experience one of the most memorable evenings I can ever re-call. As soon as this glorious sunset dissipated .. it was immediately replaced by a truly wonderful sight of the cosmos. Overall, a staggeringly awesome experience. 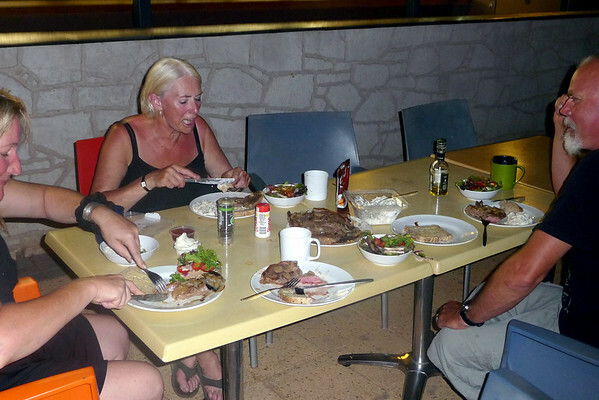 .. All finished-off with a magnificent steak barbeque. Life just doesn't get much better than this .. does it?